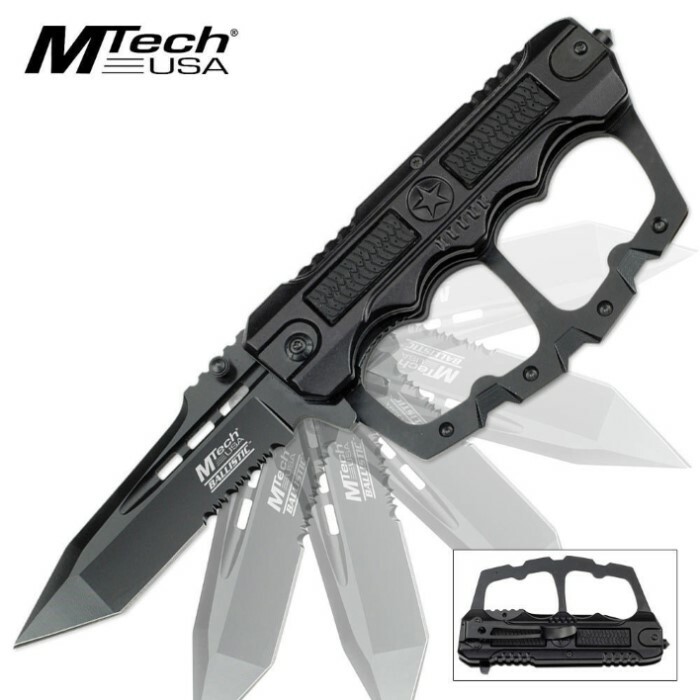 MTech Ballistic Assisted Open Knuckle Guard Folding Pocket Knife Black | BUDK.com - Knives & Swords At The Lowest Prices! MTech turns up the volume on assisted-opening folders with this Ballistic knuckle guard folding pocket knife. This aggressive design delivers a hefty, partially serrated 440 stainless steel tanto blade with a powerful assisted-opening mechanism and an aluminum knuckle guard handle complete with a crushing pommel spike. The solid black finish gives this beast of a knife a tactical look and feel. Includes a pocket clip. This knife is SOLID. heavy duty. well worth the money. opened it and was more than pleased. This knife is sick! It is really heavy for an assisted open and when it's open, it looks really big and feels really big! A durable and awesome looking knife! By far worth the $10. MTech Ballistic Assisted Open Knuckle Guard Folding Pocket Knife Black! This is an MTech.....GREAT knife very good price. Heavy duty, works and feels great! Wait for the shipping to get right, and grab a few! Makes a great gift!